The nice man sitting in 16E made more conversation than I usually like to have on an airplane. He was traveling with his elderly father, a man in the early stages of dementia whose repetitive questions my neighbor answered with the affability of the extremely patient parent of a 7-year-old. I let down my guard and made conversation about seating zones and booking tickets through Expedia and how many things about travel just don’t make sense. It’s all right there. The new is coming. Plans are being made, bookcases purchased, a kitchen rearranged for a much shorter user. Lists are being written, of things to pack and things to to sell (I hope) and things to give away and things to take to the dump. I’ve been in this house fourteen years. When I moved here from across town with three young children and two cats, a small moving van brought our things, but was quickly followed by a gigantic one full of things that had been in my parents’ house, my old home in Virginia. There were boxes into which I barely peeked, because I was busy, and the reality that my parents had both died–forever! no coming back!–felt too hard to acknowledge by picking through boxes of everything from the chest of drawers in the guest room. I got the furniture arranged, my great-grandmother’s Limoges unpacked and displayed, and then I ran out of emotional energy and let some things sit in their boxes in the basement. 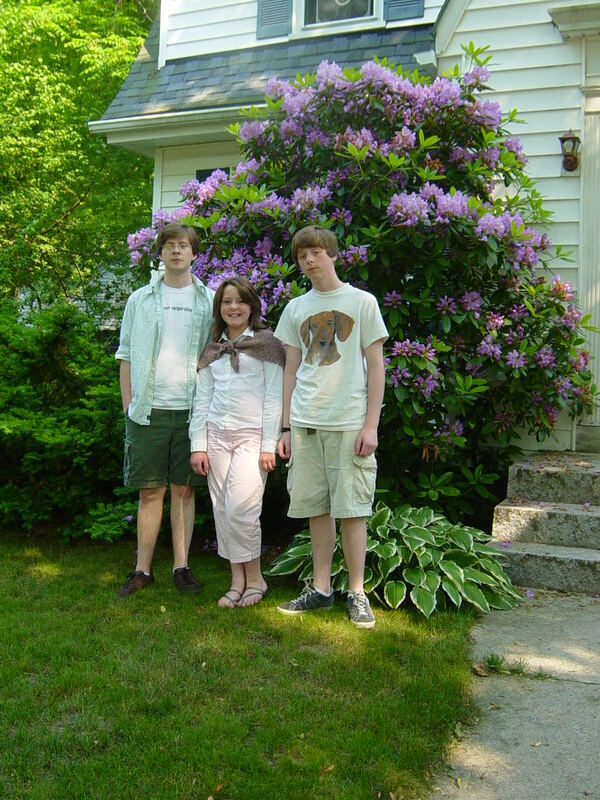 Edward, Lucy, Peter and giant rhododendron in its glory, 2006. The rhododendrons on either side of the front steps got so big they threatened to meet in the middle. I drove to the vet, the orthodontist, the optometrist, the airport, the bus station, to meetings and worship services. Dogs and cats came and went. Hearts rejoiced and broke. I drove children to orchestra rehearsals, to college, to conservatory, to the coffee shop to work across the table from each other. Other things happened, but none of them managed to make this place feel less like home. When we sat around the dining room table, we laughed, and when we get the chance to do it now, we still laugh. Those three at my table make my bones feel liquid with love and pride and continual amusement. It’s hard to leave here, but it’s not hard at all. That feeling will go with me. We’ll eat together again, at the same table, chairs arranged for our enlarged family, in a new home. As one who has moved a couple of times in recent years….I’ve been thinking about you leaving that home and moving to a new home…and the joy of the new and the memories of the past. Many blessings on this journey.